CEO Paul Nahi is out after 10 years at the helm, but restructuring indicates a path out of financial crisis. Microinverter maker Enphase is losing its long-time CEO, and gaining some financial headroom to bolster its flagging performance. On Tuesday, the same day the company reported its second-quarter 2017 earnings, Enphase reported the resignation of CEO Paul Nahi, who joined the company in 2007 and brought it to prominence as the first publicly traded microinverter maker with its 2010 IPO. Now, with the Petaluma, Calif.-based company struggling to survive against harsh competition from rival SolarEdge and incumbent string inverter makers such as SMA, Fronius and ABB, Nahi is leaving the company. In his absence, Enphase has created an office of the CEO, consisting of CFO Bert Garcia and COO Badri Kothandaraman, “to oversee and provide leadership for the company’s day-to-day activities.” In the meantime, the board of directors is searching for both internal and external candidates to replace Nahi, with the goal of naming his successor by the end of August. Board member Steve Gomo told analysts on a Tuesday conference call that Nahi’s resignation and the search for his replacement have been something the board has been working on “for some time,” adding, “We’re fairly confident we can hit that date” for finding a replacement by August 31. Second-quarter revenues grew to $74.7 million, up 36 percent from the first quarter but down from $79.2 million in the same quarter last year. Revenues for the first six months of 2017 were $129.5 million, down from $143.3 million in the same period in 2016. 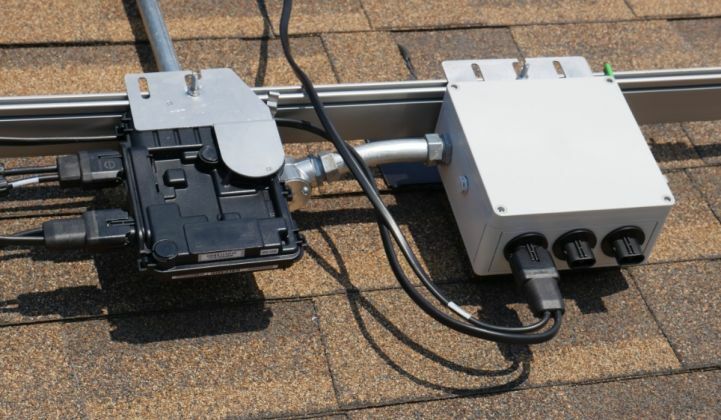 Enphase sold about 775,000 microinverters, or 224 megawatts-DC, in the second quarter, up 39 percent from the first quarter. GAAP gross margin for the second quarter was 18.1 percent and non-GAAP gross margin was 18.4 percent. Second-quarter gross profit stood at $13.5 million, down from $14.1 million in the same quarter in 2016. Gross profit for the first six months of the year was $20.6 million, down from $25.9 million in the same period last year. While Enphase works to regain ground, the company's restructuring efforts, which led to it laying off about 18 percent of its workforce in January, appear to be bearing fruit in lowering operating expenses -- which are down 35 percent on a non-GAAP basis from the same quarter in 2016. Operating expenses were $22.8 million in the second quarter and $51.9 million for the first six months of 2017, down from $29.9 million and $60.8 million in the respective periods of 2016. CFO Bert Garcia said Enphase expects to see the full impacts of its restructuring reflected through the third quarter of this year. Enphase’s GAAP net loss for the second quarter was $12.1 million, or 14 cents per share, compared to a net loss of $16.7 million, or 36 cents per share, in the same quarter in 2016. As for the company’s tight cash position, Enphase generated $1 million of cash in the second quarter to end it with a total cash balance of $31 million. Enphase is banking on its move to its next-generation IQ microinverters to continue to reduce its costs as it faces an increasingly competitive pricing environment, Garcia said. The company has seen about a 10 percent erosion in year-over-year pricing in 2017 compared to last year, driven by competition from the profitable SolarEdge. “In all candor, we have seen some competitive dynamics that we’ve been focused on,” he said. “I don’t think anyone's surprised that not only in Europe, but also in North America, those dynamics have played a part in our guidance and our financial performance in recent quarters." At the same time, Enphase’s inventory levels decreased from 61 days in the first quarter to 31 days in the second quarter, nearing its goal of a 30-day inventory. Enphase's new IQ series inverters are expected to grow from 20 percent of its shipments in the second quarter to 100 percent by the end of the third quarter, Garcia said. These reductions in inventory costs helped somewhat to counterbalance a global shortage of components for its microinverters that Garcia said was responsible for about a 1 to 2 percent hit on its operating margins for the quarter. “In our last few calls, we’ve discussed our relentless focus on improving performance,” he said. “We’ve narrowed our operating losses, and created a solid foundation on which to sustain our profitability. Much of our focus is aimed at expanding margins through several supply chain optimizations now underway." All this effort should “make it possible to achieve non-GAAP profitability by Q4” and “place the company on a much improved financial footing as we enter 2018," he said. Enphase’s third-quarter 2017 guidance calls for revenues between $72 million and $80 million, and GAAP operating expense within a range of $22.5 million to $24.5 million. Enphase’s efforts to turn around its flagging fortunes over the past 12 months have included: a secondary offering of common stock in 2016 that resulted in net proceeds of approximately $16.2 million; a $10 million investment in January from John Doerr, chairman of Kleiner Perkins, and T.J. Rodgers, founder of Cypress Semiconductor and new Enphase board member; net proceeds of approximately $11.3 million under its At Market Issuance Sales Agreement in the first quarter of 2017; and an extension and refinancing of its term loan facility from $25 million to $50 million in February. “Folks should still pay attention to Enphase's financial status, but it has taken all the necessary -- and painful -- steps to set itself up for a rebound from its recent troubles," Moskowitz said. Enphase’s efforts to break into the residential energy storage market, meanwhile, remain challenged by what Garcia characterized as a “fragmented” market with “dozens” of players competing in key markets, such as Australia. The company doesn’t break out energy storage sales, but it certainly hasn't hit its original rosy projections.